Disney's Star Wars: The Force Awakens took in $29.53 million on Tuesday and in the process surpassed the $600 million domestic mark yesterday. 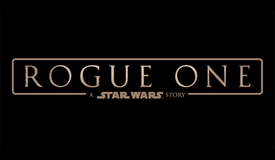 The blockbuster seventh installment of the Star Wars franchise reached the $600 million milestone in just twelve days. That easily set a new record, as previous record holder Jurassic World took 36 days to reach the $600 million mark earlier this year. Star Wars: The Force Awakens was down 6 percent from Monday and down 21 percent from last Tuesday. 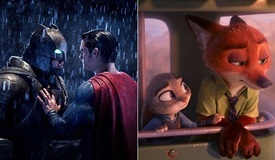 The film's Tuesday performance represented the third largest Tuesday gross of all-time (behind only last Tuesday's gross for the film and the opening day gross of 2012's The Amazing Spider-Man). Star Wars: The Force Awakens has grossed $600.95 million in twelve days. That already places The Force Awakens in fifth place on the all-time unadjusted domestic box office chart and in 29th place on the all-time adjusted domestic chart. The Force Awakens is currently running 41 percent ahead of the $427.50 million twelve-day gross of Jurassic World and 140 percent ahead of the $250.42 million twelve-day take of 2009's Avatar. Based on its continued strength this week; Star Wars: The Force Awakens is set to zoom past the $700 million mark over the weekend and will have no problem outpacing the $68.49 million third weekend take of Avatar to set a new record for the largest third weekend gross of all-time. Paramount's Daddy's Home held steady in second place on Tuesday with a strong $7.01 million. The PG-13 rated comedy starring Will Ferrell and Mark Wahlberg was up 10 percent over Monday's performance. Daddy's Home passed the $50 million mark yesterday and has grossed a significantly stronger than expected $52.13 million in just five days. That places the film 15 percent ahead of the $45.29 million five-day start of 2010's The Other Guys (which fell 4 percent on its first Tuesday to gross $4.77 million). 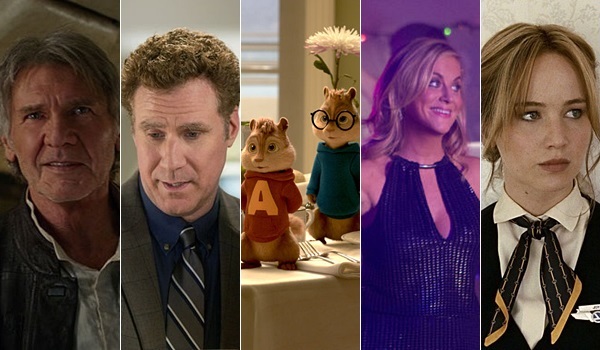 Holdovers occupied third and fourth place once again on Tuesday, as Fox's Alvin and the Chipmunks: The Road Chip took in $4.64 million and Universal's Sisters grossed $3.23 million. The Road Chip was up a very strong 27 percent over Monday and up 15 percent over last Tuesday. Sisters increased 9 percent over Monday and 12 percent over last Tuesday. Respective twelve-day grosses stand at $48.16 million for Alvin and the Chipmunks: The Road Chip and at $43.66 million for Sisters. 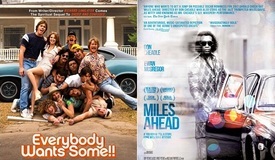 With their midweek performances thus far in mind, both films should continue to hold up very well over the weekend. Fox's Joy rounded out the day's unchanged top five with $2.85 million. The David O. Russell directed film starring Jennifer Lawrence was up 9 percent over Monday. Joy has grossed a solid $22.48 million in five days. 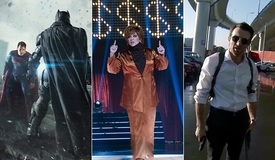 That is in line with pre-release expectations and places the film 16 percent behind the $26.72 million 2013's American Hustle had grossed after five days of wide release (though it should be noted that American Hustle had yet to experience its Christmas boost at that point in its run). Paramount's The Big Short followed in sixth place with $1.96 million. The critically acclaimed Adam McKay directed film was down 1 percent from Monday. The Big Short has grossed a promising $19.94 million after seven days of wide release and twelve additional days of platform release. The film will receive another expansion on January 8, when it will be playing in an estimated 2,500 locations. Sony's Concussion and Warner's Point Break continued to claim seventh and eighth place with respective estimated daily grosses of $1.88 million and $1.65 million. Concussion was up 12 percent over Monday, while Point Break increased a similar 11 percent. Respective five-day grosses stand at $14.05 million for Concussion and at $12.93 million for Point Break, as both films are performing on the lower end of expectations. The Weinstein Company's The Hateful Eight was far more impressive with an eleventh place take of $0.994 million from its 100 location roadshow engagement. That was down 5 percent from Sunday and gave the extended version of the Quentin Tarantino directed western a terrific per-location average of $9,935 for the day. 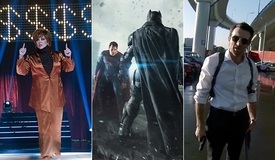 The five-day total for the film stands at $6.65 million. The Hateful Eight will be playing in 1,958 locations on Wednesday and in 2,474 locations on Friday.